£14.96 with code: TDX-TXRY mate. Blu-ray even cheaper last week at tesco. yes it was but not available now..
Not worth it for the DVD boxset, I got the Bluray for a similar or even cheaper price recently. DVD's should all be massively reduced now as nobody wants them anymore. Not worth it for the DVD boxset, I got the Bluray for a similar or even … Not worth it for the DVD boxset, I got the Bluray for a similar or even cheaper price recently. DVD's should all be massively reduced now as nobody wants them anymore. Deal has gone hot! why is it people like you try to make other peoples minds up for them? Your eyesight perhaps as that's not how you spell 'blurry'. Deal has gone hot! why is it people like you try to make other peoples … Deal has gone hot! why is it people like you try to make other peoples minds up for them? 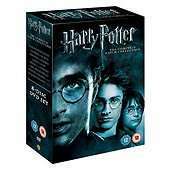 Chill out, it's a Harry Potter box set, I'm not manipulating people's votes for Thursday!! Blu-ray was cheaper earlier in the week. Is this really that good of a deal? It's still a good deal for those who do not own a blu ray player.